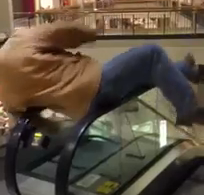 A man trying to perform a “helicopter” on an escalator failed horribly. The video is very short but you can catch what happened right at the end. This escalator helicopter fail video has already racked up more than 235,000 views on YouTube. “The guy on YouTube looked like he was having a good time so I wanted to try that,” prankster Joe Szklarski said of why he tried to recreate the stunt. But his attempt, shot at a Colorado Springs mall, was woefully unsuccessful. He failed to complete a rotation and ended up falling in the space between the two escalators and breaking the glass on the side of the machines, leaving him with a sore back but otherwise OK.
“I definitely underestimated my weight,” he said. “It was funny so it kind of makes it worth it but still I ended up on the side that I would rather have not done it in the first place,” he said.